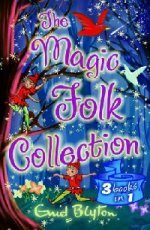 Аннотация к книге "Magic Folk Collection (3 in 1)"
"A Book of Pixie Stories" - Some pixies are sweet and helpful, but some are lazy, and the naughty ones love to play tricks. In this you will meet all sorts of pixies, so you will know what to do if ever you see one. "The Book of Fairies" - Follow the adventures of Betty, the girl who doesn`t believe in fairies - but soon changes her mind, Karin the shy gnome, and many more. "The Book of Brownies" - Hop, Skip and Jump are three naughty brownies who love to play tricks. But when a wicked witch tricks the tricksters and has them capture the little fairy-princess Peronel for her, they are turned out of fairy land by the angry king. These are magical tales of excitement and adventure from Enid Blyton.